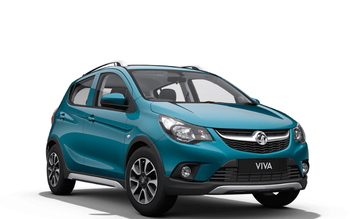 Vauxhall Viva Rocks with Motability. "My experience at Wilson & Co Scunthorpe was positive because the sales person was clear and concise explained everything thoroughly, she was polite and pleasant. " "I'd recommend Wilson & Co Scunthorpe to anyone because of the attitude that when I was looking for a vehicle, a background search was carried out and a vehicle was found to my speciation's after a period of two months. " "Wilson & Co Chorley were great because they were helpful without being pushy." "I'd definitely recommend Wilson & Co Bolton because at no point during my visit did i feel pressured by the salesperson Simon Wood who provided an excellent service all through my purchasing my vehicle." "Wilson & Co Chorley were helpful and friendly, happy to recommend"
"I'd definitely recommend Wilson & Co Bolton to friends and family because they made the process of buying a new car straightforward & easy. Raymon the sales person was friendly, polite & informative & explained each step of the purchase in a concise & eas..."
"I was pleased with Wilson & Co Scunthorpe and would recommend them because me and my partner was looked after from start to finish by Matthew, everything was explained in detail the friendly salesman went above and beyond to make sure we drove away in our..."
"I had a great experience at Wilson & Co Bolton because the staff were very friendly and efficient "
"My experience at Wilson & Co Bolton was positive because of Charlie the salesperson who was very polite and knowkedgable. What an asset to your team." "I'd recommend Wilson & Co Bolton because they delt with us very professionally and gave us the best deal available,Salesman Brian was superb and a credit to your company." "Wilson & Co Grimsby were great because I got what I wanted "
"The staff at Wilson & Co Grimsby were good because Nothing is too much trouble they are friendly, courteous and polite, having dealt with them for a number of years now i wouldn't go anywhere else"
"Wilson & Co Chorley staff were good because they were quick and efficient and couldn’t do enough for you, very pleasant sales manor and professional "